In the past 5 years, a global shift in the trading practices of financial circles around the world has been noticed. As traditional ways and institutes make way for newer methods of forex, stock, and options trading, online trading platforms are one of the most popular forms of trading. Most of the world’s online traders use either iOS or Windows on their computers as their operating systems, which are also the most widely used around the world. However, for the small minority of online traders who use a Linux operating system, compatibility becomes a major issue to deal with. This is primarily because of the absence of online support resources for Linux based systems. Very few trading platforms offer a Linux compatible variant for users to use, including names like Meta Trader 4, one of the most widely used trading platforms now. However, a lot of these Linux based trading platforms are plagued by bugs and issues that need to be addressed. To summarize the general drawbacks of using an online trading platform on a Linux operating system, a list is given below. Not much online support is available. Registered in Cyprus and regulated by the Cyprus Securities and Exchange Commission, IQ Option is a reputed online brokerage platform that allows users to trade different financial instruments, ranging from stocks, forex pairs, cryptocurrency CFDs, ETFs etc. IQ Option has also released a downloadable application for Linux compatibility, but was discontinued shortly thereafter. However, IQ Option offers a web based version of its application, accessible through Chrome, Opera, Firefox and Safari, which has all the necessary features for providing a seamless experience for traders. Being one of the most liquid instruments in the financial trading world, the forex market is one of the most traded markets in the world, with a daily turnover exceeding several trillion dollars. So quite naturally it attracts a lot of speculators, who find the low spreads to be favourable. 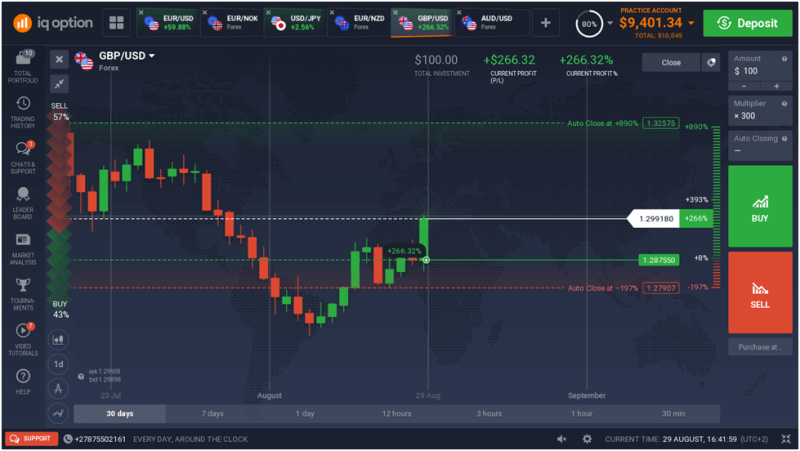 At IQ Option, users can select from a collection of 88 currency pairs, including the top traded currencies in the world such as the Great Britain Pound, The US Dollar and the Japanese Yen. Forex trading is available with pre-set stop loss and take profit order features. They also allow certain currency pairs such as the EUR/USD, GBP/USD, GBP/CHF, GBP/JPY and USD/JPY to be traded with a leverage of up to 1:1000. IQ Option provides Stock trading in CFDs, with a collection of 174 stock CFDs available to be traded with leverage. Stock CFDs have a minimum trading amount of $20 per trade. The cryptocurrency trading market has seen a rapid explosion in popularity, with many traders being attracted to Bitcoin’s massive volatility. IQ Option offers Cryptocurrency CFD trading where users can speculate on the bearish or bullish movements of cryptocurrencies without actually having to own any. Thus the potential for profit is the highest in this kind of trade, since the user tends to make a profit even if crypto-prices are falling. IQ Option offers two types Cryptocurrency CFDs, namely Standard Crypto CFDs and Special Crypto CFDs. There are certain restrictions present however, such as the absence of leverage trading for retail traders of the EU. Special CFDs have a much higher leverage and lower spreads, which expire on a daily basis. IQ Option has an impressive range of different Options trading for their users. These include Digital Options, Binary Options and FX Options. Digital Options is a new and exciting way of options trading where the potential pay-out can reach up to 900%. Traders also have the option of choosing different strike prices. Digital Options have an expiry time between 1 to 5 minutes, with the option of entering trades within that time frame. Digital Options come in different currency pairs, with 19 standard digital options tradable during weekdays, and 8 over the counter digital options for trading on weekends. They can be traded by the pro-EU as well as non-EU traders but are not accessible by the retail traders from EU. Binary Options trading is one of the first trading services offered by IQ Option, which is active since 2008. They have a collection of 60 binary option instruments for users to choose from, containing not only forex pairs, but different stocks, stock indices, and gold. Binary Options trading can be done with a broad range of the intraday expiry times, with the lowest expiry time being one minute. Payout percentages can vary depending on the time of day along other factors such as news releases, rate of market liquidity, etc. The maximum pay-out is usually between 90 to 95%, which in some cases may rise even higher. They also offer OTC binary options trading offered during weekends. It should be noted, however, that retail traders from the EU do not have access to both digital and binary options trading. IQ Option has thus introduced a third type of options trading known as FX Options specifically for retail traders of the EU. FX Options are the only financial instruments that can be traded by retail EU traders, offering uncapped profitability for successful trades. The profit depends on the magnitude of the price movement in the time available until the option expires. IQ Option provides CFD trading in commodities, which enable traders to speculate on the prices of different metals, crops, energies etc, without owning any actual shares. CFD trading in stocks allow users to either buy (go long) or Short (go short). With a myriad of options to choose from when it comes to online trading platforms, very few can provide the functionality, security and the compatibility offered by IQ Option. With such a comprehensive platform available with a minimum account opening amount of $10 and a free lifetime Demo Account, IQ option caters to all types of traders, even those who use Linux machines primarily.